The design and faceting on the surface of a gemstone is known as the 'cut'. 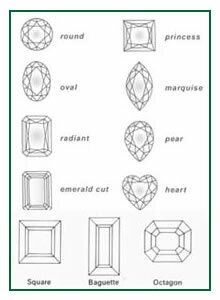 Cut is important to an emerald's overall appearance. Greater precision produces a greater life and sparkle. The best score and scale in the cut rating is a combination of a perfect gem cut (a clean, polished surface free of surface fissures) and an excellent faceted shape. In all cases, a well cut emerald is symmetrical and reflects light evenly across its surface. A washed-out area in the center of the emerald is the result of a cut that is either too deep or too shallow. An emerald with a more saturated color, the best cut may be more shallow than average, permitting more light to penetrate the gemstone. While in a less saturated gemstone, the color may benefit from a deeper cut. The shape of an emerald is generally determined by the raw material. Usually with colored gemstones there are many variations on the basic oval cut (e.g. cushion, antique and barrel), emerald cut (baguette and princess), among others. It is typically determined by rough material. In colored gemstones, there are many different variations of the basic shapes of ovals, (e.g. cushion, antique and barrel) emerald cut, (e.g. baguette, princess cut, cut corners), among many others. Emeralds have a table, crown, girdle, pavilion, and culet. Emeralds are frequently cut in a rectangular step cut - a cut used on emeralds so often it's usually referred to as an "emerald cut." The clipped-off corners protect the stone from breakage and provide places where prongs can grip securely. The score of shape is based on the symmetry of the emerald form, the presence of windows and the irregular shape of the stone. The brilliance of a stone refers only to faceted gemstones. When a gemstone is properly cut and the material is translucent and crystalline, the play of light and reflection emanating from the gem is commonly referred to as its 'brilliance'. Collectors enjoy seeing their gem's vibrant sparkle under a variety of lighting conditions. Polish describes how smoothly the facets of an emerald have been polished, whether any marks are visible from the polishing wheel, and how defined the edges of each facet are. Since these characteristics are rarely visible to the unaided eye, for an excellent value, look for a polish grade of very good or good, though the higher grades of ideal and excellent are also recommended. Avoid emeralds with polish grades of fair or poor, as the quality of their polish may affect the brilliance of the emerald. The polish of an emerald should be smooth, without any nicks or scratches.